A couple of days ago, the seeds I ordered from Sustainable Seed Company came in the mail. Thanks "Garden Now Think Later" for telling us about this AWESOME seed company. After I read her post, I looked at the website, and I love their seed pledge. This is definitely a company I want to support! I took advantage of the great half off sale they were having. 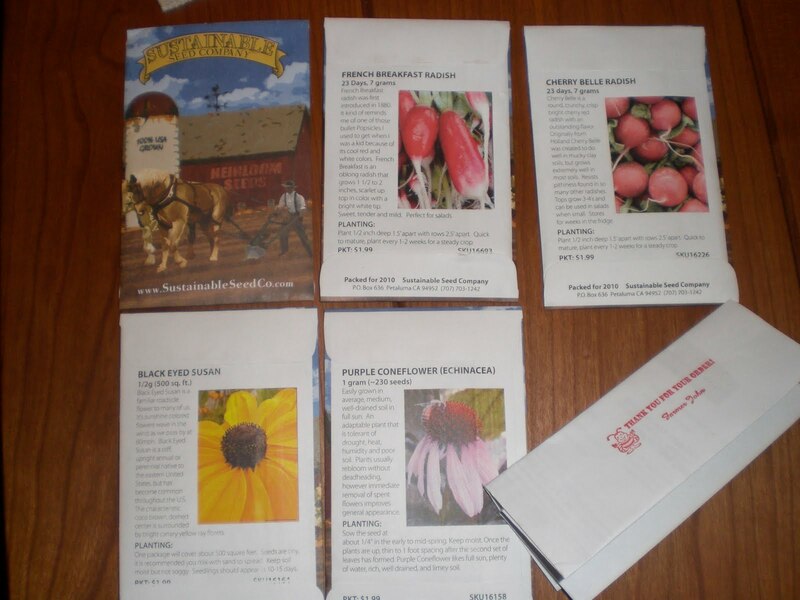 I picked up seeds for echinacea that I want to grow next year. Has anyone ever grown Black Eyed Susans and Coneflower from seed? Is it hard to germinate? For the fall crops, I bought Cherry Belle and French Breakfast radishes and some buttercrunch lettuce. I hate radishes, but my husband eats them like candy. I think they are too peppery for my taste. 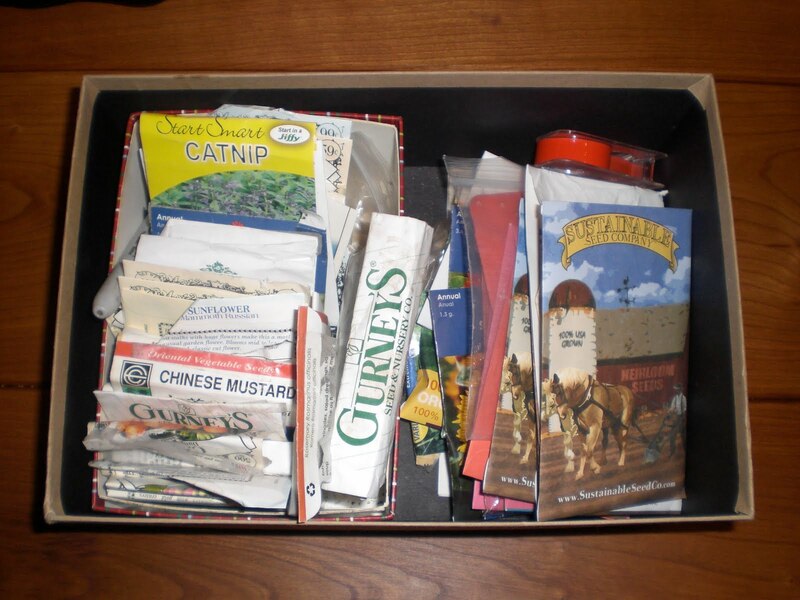 My seed box is growing! I had to upgrade to a bigger box! Since there are more than enough seeds in the new packets, if anyone wants to do a seed exchange for any of the radishes, lettuce or flowers, let me know! Good luck with your new seeds. Looks like you'll have lots of stuff to grow! Glad you liked them! I have my broccoli and lettuces started indoors. I was hoping to start flats outside but it's still too hot! I can't wait until it cools down to at least the 80's so I can really start cleaning up and planning the fall garden! I have had trouble growing Black Eyed Susans, the climbing kind, not sure if that is normal or not! I made my first order with Sustainable Seed Company last month. Just a few things for the fall garden. I'm glad to read your high praises of them. I planted both black eyed Susans and echinacea last spring. Both were slow to germinate, but the black eyed Susans have been blooming like crazy. My echinacea plants are still little, but hopefully they'll bloom next year. I love to see a full seed box. :) Seeds make me happy -- unless they are GMO seeds. I've discovered the "Safe Seed Pledge" just this last season, and lots of great companies are taking it. It is so important for us to try and stake out a tiny claim against this wave of deadly gene manipulation that threatens plant biodiversity and health and the freedom of our food supply. Sometimes I think *everything* is on the line. Thank you for doing your part, Meems. Hi meemsnyc, looking forward to hearing about how those seeds grow for you! I responded to your comment question about all squash flowers being edible, but in case you haven't seen it, the answer is YES! All squash flowers (summer and winter) and even all cucurbit flowers (melons, cucumbers, etc.) are edible, just like zucchini flowers.